Creating a Data Management Plan (DMP) is an essential first step into research data management. 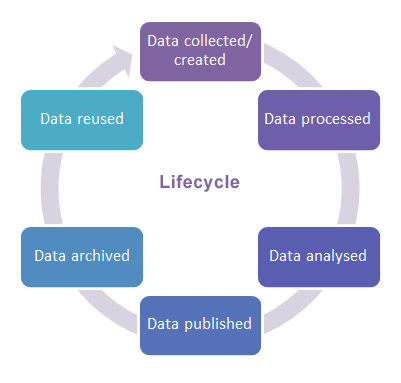 You should plan to manage your research data through all stages of the research lifecycle. Meet funder’s requirements. Most funders now require a data management plan either at the application stage or once the funding is awarded. The Digital Curation Centre has created a quick guide to the data management plan requirements of the major UK research funders. Resourcing - are there research data management costs which should be reflected in your budget? RCUK have committed to support data management in all of its funded projects which means you can include Data Management costs in your research grant such as expenses for data anonymisation, secure data storage etc. You need to mention this in your Data Managament Plan. Have a look at the "RCUK Responses (pdf) to questions raised at the DCC/RDMF Special Event on funding for Research Data Management from April 2013 (especially section C) for details. Training and support (email: researchdata at warwick dot ac dot uk) – are there skills and training requirements in this area in your team? If so have you costed them into your project? The Digital Curation Centre (DCC) has created a checklist for a data management plan as well as a template (Word), which draws together details researchers often are asked to provide in data management plans.